Civil War divides a nation, yet nothing will stop Grayson Drake from breaking Corporal Marx Wellbourne out of a Union prison. Assigned to bring Wellbourne to Richmond, Grayson soon discovers not only is the Corporal courting death, but he’s also the same man he coveted from afar four years ago in a Charleston brothel. Pursued by the villainous warden of the prison, Major Britton Darkmore, nothing is as it seems when intrigue, danger and passion collide on the Long, Hard Ride back to Richmond. 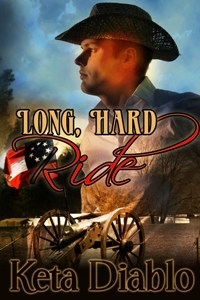 The title and the Civil War genre first attracted my attention to Long Hard Ride by Keta Diablo [Decadent Publishing, 2010] and as an in-the-saddle story it delivers quite well. However, it is more of a period story, as apposed to historical fiction, for the American Civil War is merely a backdrop. Nonetheless, I will quickly add there is nothing wrong with this except the tag. The crux of the story is that Marx Wellbourne is being held in a hellhole of a Union prison, known by its pejorative, “Helmira,” and is in dire straights. But inside his head are battle secrets that the South is desperate to know, and so Grayson Drake is sent to spring him from this maximum security institution. The warden, Major Britton Darkmore, is a stereotypical villain who psycho-pathetically guards his ‘no-escape’ record, and so when Wellbourne is sprung the pursuit is on from New York State, to Richmond, Virginia. Along the way Grayson and Wellbourne have a rather tempestuous relationship, with neither one trusting the other, but they nonetheless manage to get it on both hot and heavy—such, that an uneasy love bond is formed. Critically speaking, the writing is both strong and mature. The sentence and paragraph structures are smooth, such that the reader isn’t stubbing a toe over rough patches, and the dialogue is effective and believable. As I have also alluded above, the characters are well developed but somewhat stereotypical—villainous warden, macho and omni-capable hero, and a reluctant lover. Nevertheless, they are consistent and made to play their parts well. The plot is also clever, but being a bit ‘fantastic’ it could have benefited from more development. For instance, the secretive agency for which Drake worked could have done with more expansion to make it credible, and the happenstance surrounding Wellbourne’s escape from Elmia Prison—as well the old boy’s lodge that just happened to be there when it was needed—could have used some further thought. Nonetheless, overall it was an entertaining read that had some top-rate moments. Recommended. Three and one-half stars. 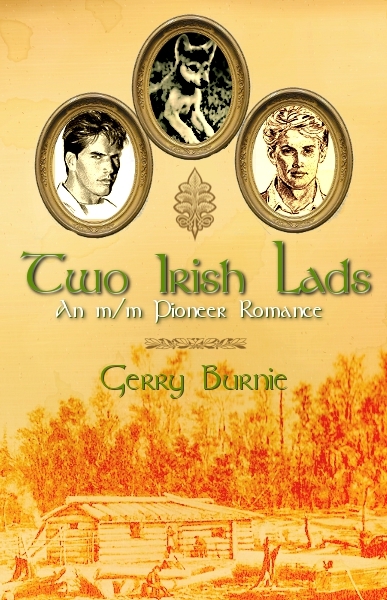 This past week I entered into a deal with Maple Creek Media to format Two Irish Lads in eBook format. This will be a stand-alone publication with a new cover design by Alex Beecroft and a separate ISBN number. Therefore, this old scribe is entering (slowly) into the 21st-century. The manuscript for Nor All Thy Tears: Journey to Big Sky is now in the hands of the publisher, and so it is on schedule for a July, 2011, release.